Eoabelisaurus is a new genus of jurassic abelisaurid. It is the oldest one and shows how abelisaurs arms have developed. 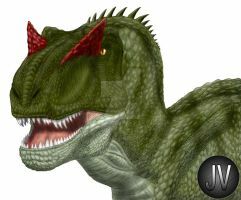 It has arms that were short, but longer than the ones of later forms like majungasaurus or carnotaurus. Eoabelisaurus, meaning dawn abelisaurus , was around 6,5 metres long and lived in south america. The animal is known from a nearly complete skeleton. Here's the question: We're currently writing the Wikipedia Article about Eoabelisaurus - and so we came across your image. May we use it on Wikipedia (in a smaller, rescaled version)? What is the copyright situation? this pic doesnt have a creative commons license at the moment but as far as I know this is neccescary to show it on wikipedia. If you can tell me what I have to change on the license so it can be shown on wikipedia, you can show it on wikipedia. thanks for your quick reply .... ! I don't know the precise license details either, but since you are the artist yourself I think we can keep the legalese mumbo short ..
As far as I know, the act of putting it on Wikipedia makes it more or less free unless you object. So, I will put it on Wikipedia and send you the URL in a minute. If you want to object, simply remove it yourself from there, or tell me and I'll remove it again. Thanks again for the great drawing. PS: I hope the other Wikipedia guys like it as well. Of course, in case they don't, they will edit it out. But, turns out, we do have to wait a bit longer because image uploading at Wikipedia has a grace period and requires confirmation. In any case, we're at it and will keep you posted ! Amazing! I really like the neck flesh, like a mix of iguana and a rooster. But my question is: Whos is the antecesor of Abelisaurids? Ceratosaurus? This last one couldnt be with this guy. A ceratosauria member that envolved to ceratosaurus in the north and to eoabelisaurus in the south. it is probably some sort of ceratosaurian. But which one?-we dont know so far..
Eoabelisaurus already has this short head,so I think there must an abelisauroid with a more longer head that is the ancestor of the aelisaurs.